The Good Times Blog: EXTRA! EXTRA! Huge Breaking News Political Shocker! EXTRA! EXTRA! Huge Breaking News Political Shocker! Condi loves FOX News. I know that this might come as a shock to you. I probably should have told you to sit down before you read this post, but I forgot. I'm sure you are wondering "How could that be true??" but I got my info straight from the horse's mouth. I do believe the exact quote was "My Fox guys, I love every single one of them." In a way, it is kind of refreshing. It is the first thing she has ever said that I haven't had to wonder if she is lying. I don't know if I'm thrilled or disappointed to know that she is capable of the truth, but I suppose we should applaud the successes of the administration, too. So, here's your pat on the back Condi. Way to go for telling the truth...once. And, while I'm at it: Mr. President; thanks you, too. There was one part of your speech the other night that didn't make me want to throw up. You know, the part where you took the blame for your policy faiulres in Iraq. Novel idea as there have basically been no successes. In the spirit of owning up to things - I can't spell. I love Fox News, too. 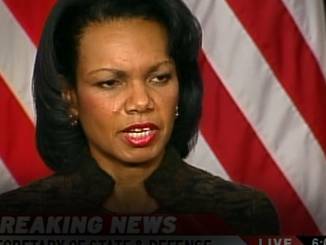 Condi is one of the most straight-forward, straight-shooting people in politics. Three cheers for Secretary Rice!